Recent organising and demonstrations around the issue of police accountability in Philadelphia, set in motion by grand jury decisions in Ferguson, Missouri and Staten Island, New York not to indict police officers who gunned down unarmed African American men, have taken a new, though rather historically familiar, twist. Laura Krasovitzky, a University of Pennsylvania student organiser, tells The Declaration that she was visited on the morning of December 8 by a Philadelphia Police Department detective, who she soon learned was in the Homeland Security Bureau, asking about posts in a Facebook group. “The detective told me he was there because of specific language I used in the notes I posted on the ‘Ferguson to Philly’ Facebook group after the town hall meeting of Dec. 2. He had the notes printed out,” Krasovitzky says. Krasovitzky, who says she is active in several causes but has been mostly focused on work with Students Organizing for Unity and Liberation (SOUL), which has been heavily engaged in actions responding to both the Ferguson and Staten Island non-indictments. SOUL staged a die-in attended by hundreds in December, and was represented at a December 2 town hall meeting held by community organisers in response to the verdicts. That community forum produced a list of “movement demands” — and language contained in that list brought Detective Ray Rycek to her dorm room at 11am. He wanted to know about language in the notes which Krasovitzky had posted to the page, notes the student organiser had collected from various participants in a related working group from the Calvary meeting. She says the notes described “targeting” the Christmas Village at Love Park, “targeting” disgraced and rehired Philly cop Jonathan Josey, and “targeting” Commissioner Charles Ramsey in an upcoming protest action. The Dignitary Protection Division detective told Krasovitzky that this was considered threatening, and questioned her regarding any plans for violence against the Commissioner or other persons. 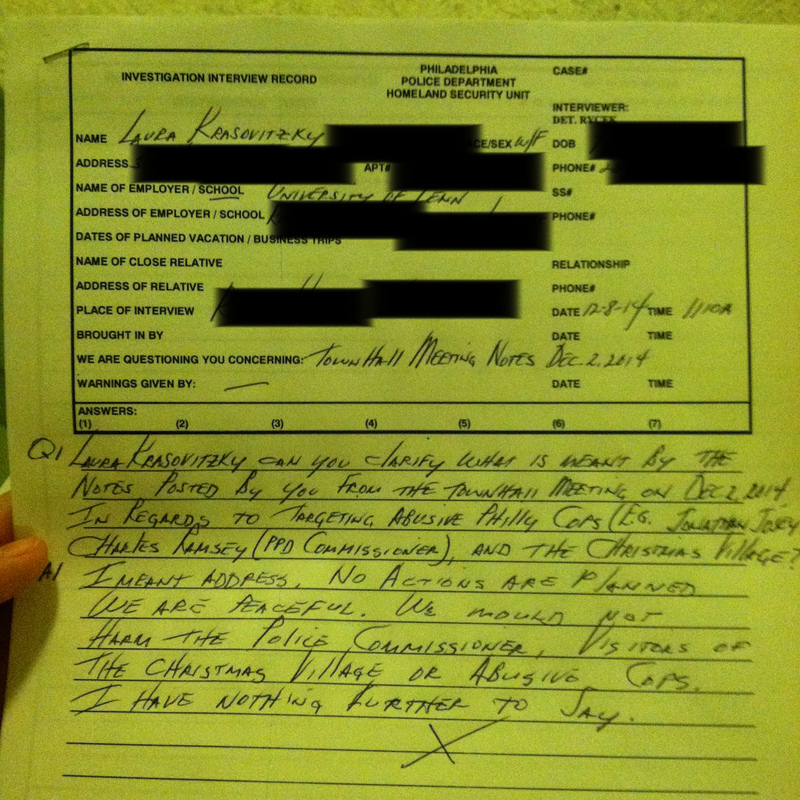 Before eventually asking if she was being detained and upon being answered in the negative, stating that she had nothing further to say, she completed a form the detective had brought with him. It contained Krasovitzky’s personal information, including her address and date-of-birth. She refused to sign the form, but says the detective told her she could take a photograph of the document, which she shared with The Declaration. You can view a copy, redacted for her privacy, here. The Declaration learned of the interview via a representative of Philadelphia IAC, an initiating organisation with the Ferguson to Philly Emergency Response Network. It released a statement regarding other police responses to the same December 2nd town hall meeting in West Philly. According to Philly IAC’s statement, the day after the event held at Calvary United Methodist Church, an unidentified member of the Philadelphia Police contacted the church’s sexton and complained about the meeting and “red-baited” organisers, telling sexton Ed Fell they were communists. Calvary Methodist has not responded for comment. Krasovitzky said she was rattled by the visit from law enforcement, and reluctant to speak about it until friends encouraged her to go public. “This is clearly full intimidation, it’s what they do,” she said in an interview last night. She is seeking answers from the university regarding what policies allowed the detective to be given access to the private facility to reach her dorm room. A senior police department official has not yet responded to our inquiry regarding this matter. It would seem that Krasovitzky is guilty of nothing more than using slightly militaristic bureaucratic language, like a marketing campaign “targeting” the 25-34 demographic or a social-service outreach effort “targeting” at-risk youth. 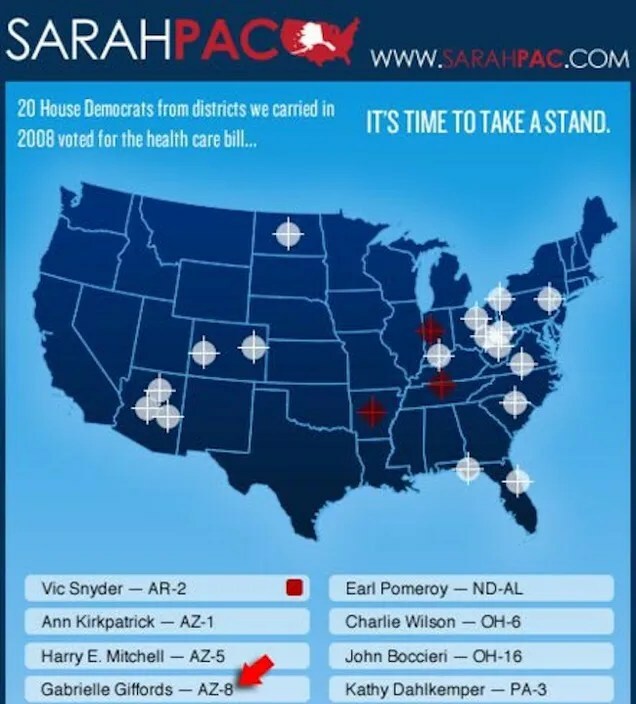 That is considerably less ‘militaristic’ than US Republican Party politician Sarah Palin, who infamously published a picture of the crosshairs of a firearm aimed at Democratic Congresswoman Gaby Giffords, who subsequently was really shot. I don’t have any information that United States Homeland Security ever questioned Ms Palin about this. Fighting Gag Order, Ferguson Grand Juror Accuses Prosecutor of Mishandling Case & Misleading Public: here. The NAACP’s Legal Defense and Educational Fund, citing “grave legal concerns,” is asking a Missouri judge to convene a new grand jury to consider charges against the Ferguson police officer who fatally shot 18-year-old Michael Brown: here. A homemade bomb exploded outside the offices of the National Association for the Advancement of Colored People (NAACP) in south Colorado Springs Tuesday, in what the FBI has called a possible act of domestic terrorism. Police are currently searching for a person of interest spotted by eyewitnesses, described as a “balding white man in his 40s” driving an older pickup truck: here. In a further drive to punish and criminalize dissent, the city attorney of Bloomington, Minnesota is seeking charges against organizers of a recent protest at the landmark Mall of America over the spate of police killings last year that have triggered demonstrations nationwide: here. This entry was posted in Computers, Internet, Human rights, Racism and anti-racism and tagged Missouri, Pennsylvania by petrel41. Bookmark the permalink. Duane St. bet. Foley Sq. & Bdwy.